Your little one has a tiny stomach which needs refilling very often. Listen and look for rhythmic, repetitive cry, combined with other signals such as sucking the fingers or the above codes that will help you understand better. For some babies, a soiled diaper is a surefire way to trigger tears. Check your baby's diaper often to make sure it is clean and dry. Get ready for aggressive behavior or the intense screams. This can either be colic or the gas that's accumulated to be released through burping. This often occurs in the late afternoon or evening. You'll hear a cry that starts slowly and builds in intensity. This is accompanied by yawns or eye-rubs. If your baby is too hot, he/she is likely to be uncomfortable. The same goes for a baby who's too cold. Add or remove a layer of clothing as needed. 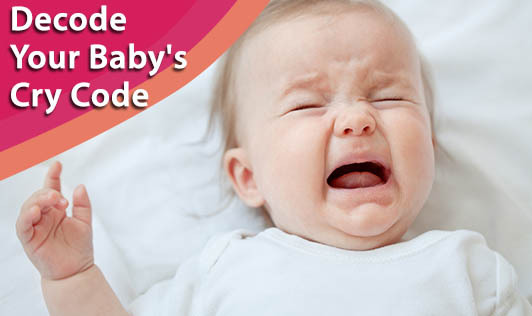 If your baby is bad tempered, he/she may try to turn her head or body away from over stimulating sights or sounds. Paying more attention and spending quality time with your kid will help you pick up cues from a particular code. Now, you can say that your baby is actually speaking to you!